WHISKAS ® PERFECT PORTIONS™ Cuts in Gravy Chicken & Tuna Selections 12pk is rated 4.0 out of 5 by 1. Tuna Entree: Chicken Broth, Tuna, Chicken, Chicken Liver, Poultry By-Products, Meat By-Products, Tapioca Starch, Vitamins and Minerals, Natural Flavor, Sodium Tripolyphosphate, Fish Oil (Preserved with Mixed Tocopherols), Colour, Xanthan Gum, Salt, Taurine, DL-Methionine Chicken Entrée: Chicken Broth, Chicken, Chicken Liver, Poultry By-Products, Meat By-Products, Tapioca Starch, Natural Flavour, Vitamins and Minerals, Sodium Tripolyphosphate, Colour, Fish Oil (Preserved with Mixed Tocopherols), Salt, Xanthan Gum, Taurine, DL-Methionine. 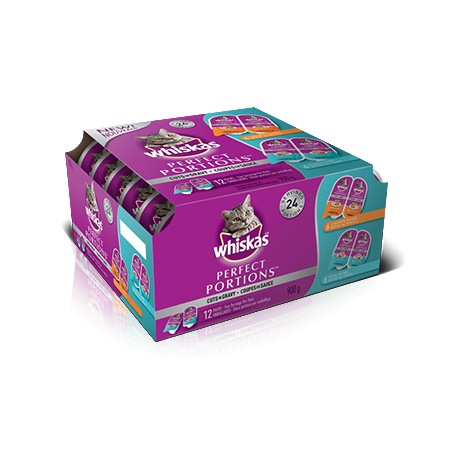 WHISKAS® PERFECT PORTIONS™ Cuts is formulated to meet the nutritional levels established by the AAFCO Cat Food Nutrient Profiles for all life stages.